Earl Hoover Beistline has had a distinguished career as mining educator at the University of Alaska in Fairbanks and was the preeminent leader of the Alaska Mineral Industry for decades. Beistline brought to the classroom a unique blend of theoretical and practical knowledge in the field of mining. During all of his adult life, he has been a tireless and outspoken advocate of Alaska mining industry interests. Earl Beistline was born in Juneau, Alaska on November 22nd, 1916, to Ralph and Catherine Beistline. Ralph came to Alaska in 1908 to help build the famed 'Million Dollar Bridge' over the Copper River, the construction of which insured rail access from Cordova to the Kennecott copper mines in the Wrangell Mountains. Later, Ralph Beistline spent a number of seasons hoisting frozen, gold-bearing gravels to the surface for underground drift mines in the Fairbanks and Richardson mining districts of Interior Alaska, before deciding to settle down in Juneau. Eventually, Earl's father would work on a variety of job assignments for the Alaska Juneau (AJ) Gold Mining Company and its predecessors for nearly 30 years. "When I heard talk of the Great Depression during my teen age years, it just didn't apply to Juneau. There were plenty of employment opportunities for anybody who wanted to work in those days." In 1934, Earl entered the Alaska Agricultural College and School of Mines in Fairbanks, which became the University of Alaska the following year. He enrolled as a student in the School of Mines and earned a B.S. degree in Mining Engineering in 1939. To earn money for school, Earl worked summers at either the AJ Mine in Juneau or in the thaw fields of the USSR&M dredge fleet near Fairbanks. Earl also kept busy in the winter sports arena in both the University of Alaska (UA) hockey and basketball programs. In 1936, he played his part on the UA 'Polar Bears' hockey team with classmates Glen Franklin, Patrick O'Neil, Gordon Picotte, and Erwin Clahassey. At the 1936 Anchorage Fur Rondezvous, a combination of UA and Fairbanks hockey teams defeated teams from Anchorage and Palmer, and won the Fur Rondy hockey championship. Later that year, at the Ice Carnival held in Fairbanks, the UA 'Polar Bears' hockey team defeated the highly favored Dawson, Yukon team by a score of 6-5. Earl also co-managed, with Patty O'Neil, the 1936 and 1937 UA 'Polar Bears' basketball team. 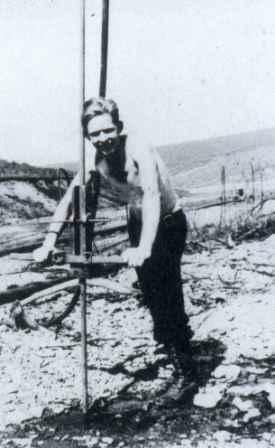 Mining engineering student Earl Beistline hand-driving a steam point in the Goldstream Valley thaw field, circa 1936. Photo from the Beistline family collection. After earning his mining engineering degree in 1939, Earl wasn't sure what he wanted to do with his life. He audited several geology classes, worked part-time in the Territorial Assay Lab, located on the University campus in Fairbanks, and labored for the FE Company. In 1940, he and others dug out (by hand) the rotten, wooden hull of Dredge #7 on Fish Creek and installed large steel plates for structural reinforcement. In 1941, he worked for FE supervising drilling, blasting, and mucking crews in the Nordale and McCarty gold mines near Cleary Hill. "Most of my duties revolved around the manufacture of chemical bombs for the Aleutian Islands campaign." Beistline was eventually promoted to the rank of Major and discharged in 1946, when he returned to Fairbanks. "The year 1946 was a banner year for me, when important events changed the direction of my life." 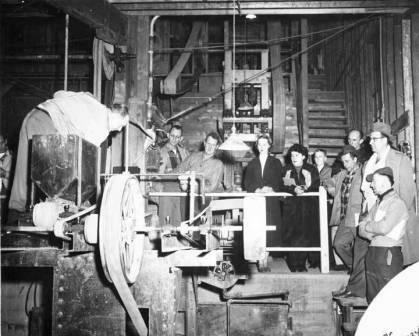 During the summer of 1946, Beistline devised a new method for sampling placer concentrates while working on a gold dredge on Caribou Creek, east of Fairbanks. He would later write a thesis about it, earning an Engineer of Mines (E.M.) degree from the School of Mines in 1947. Topping the list of important events, however, was his courtship, and marriage in August 1946, to Dorothy Hering, a beauty queen and daughter of a well known Fairbanks family. Family tradition has it that Earl had a bet with his buddies that Hering, whom he did not know, would win the crown of Miss Winter Carnival for 1946. Dorothy won. Earl was then persuaded by his friends to use the money that he'd won to take the queen out to dinner, which he did. Earl and Dorothy were married several months later. The couple would have four children, Ralph, Bill, Catherine (Kathy), and Linda. All four children still live in Alaska. Dorothy, his incredibly supportive wife during Earl's career at the University, and who would later become one of Fairbank's top professional florists, passed away in 1996 after a short battle with cancer. "Earl took over Jordan's place with no advanced notice and by a diligent effort, quickly became an excellent instructor." Even though teaching would soon dominate his life, Earl would still continue to work as a practicing mining engineer. During the summer of 1947, he worked in Columbia at the invitation of former student colleague, Patrick O'Neil, the Vice President of South American Gold and Platinum Company. Earl's American Association for the Advancement of Science presentation in Fairbanks later that year emphasized both engineering and geological aspects of the Columbian placer deposits being mined - including a platinum placer deposit larger than Alaska's Goodnews Bay district. Beistline's career with the University quickly spiraled upwards. 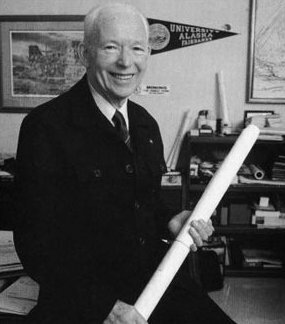 After becoming a Professor of Mining Engineering in 1946, President Bunnell appointed him Dean of the University Of Alaska School of Mines in 1949, a post he held under several reorganizations until retirement. On June 2, 1960, Beistline, still the Dean of the UA School of Mines, accepted the position of Dean of Faculty for the entire University of Alaska system, replacing Charles Sargent, a professor of Civil Engineering, who wanted to return to teaching and research. Earl would serve as Dean of Faculty for 10 years. On July 2, 1970, Beistline was named the first Provost of the University of Alaska's Fairbanks campus, a position he held through much of the 1970s. During ensuing years, Dean Beistline also served twice as the Academic Vice President for the Statewide University of Alaska system. For short periods, Beistline was the Acting President of the University of Alaska during the administration of President William R. Wood. Some of Beistline's duties at the University of Alaska were not related to teaching a mining curriculum or the managing of academic affairs. In the late 1960s, during the height of the Viet Nam war, student activists announced that they would hold a series of demonstrations on the UAF campus. Remembering the recent violence at campuses around the country, some on the Faculty Senate urged Beistline to expel the organizers, which included some faculty members. Instead, Earl met with the demonstrators and afterwards recommended to President Wood that he set aside a day for campus demonstrations, which he did. That day, Earl joined the students around the Bunnell Fountain in the center of the UAF campus, where they sang songs, gave speeches against the war, and read poetry. Dean Beistline later said he disagreed with the opinions of the anti-war activists, but not with their right to express their views. There was no violence or disorderly conduct on that day nor was there ever on the campus of UAF thereafter. During Beistline's tenure as UA's chief advocate of mining education, there were significant changes taking place as the Alaskan Territory became the 49th State. The fixed price of gold had caused the gold industry to decline and base metals did not recover after WWII. At Statehood, there was practically no hardrock mining industry left in Alaska, so mining education at UA had to respond to these realities. In 1962, after nearly 40 years of existence, the School of Mines was included into the College of Earth Sciences and Mineral Industry. In 1975, the core of the old School of Mines became the School of Mineral Industry, later changed to School of Mineral Engineering in 1984, which remained under that name until the recent reorganization to School of Engineering and Mines in 2005. Perhaps the most difficult reorganization took place in 1975, when the geology program left the College of Earth Sciences and Mineral Industry and was transferred to the College of Environmental Sciences. Dean Beistline strongly opposed the reorganization, and tried to stop the geological faculty from being transferred; however, he was not successful, despite his considerable influence on campus. The writer was the President of the Student Mining Society on the UAF Campus during 1973, when the reorganization was being formulated, and remembers this was a very contentious time indeed. The always dynamic Beistline moved to change programs in response to the ever changing needs of mineral education and research. In 1966, after years of diligent work, Dean Beistline established the Mineral Industry Research Laboratory (MIRL), appointing Dr. Ernest 'Ernie' Wolff as its first director. MIRL quickly began to produce valuable compilations of past Alaska mineral deposit and mines information, which served as useful guides for the newly emergent mineral exploration industry. MIRL's important research continues today. In 1979, with colleague Ernest Wolff, Beistline organized the first spring Interior Mining Conference held in Fairbanks. The first several conferences were held on the campus of the University, and knitted together university and government-funded, applied research with the needs of the re-emergent placer gold mining industry. Although other aspects of mining would eventually replace the 'placer only' theme, the now biennial 'Interior Mining Conference' remains an important, applied educational vehicle to this day and a core activity for the Fairbanks Branch of the Alaska Miners Association. In 1981, Beistline designed and created the Petroleum Engineering Program, in response to the growing needs of the State's petroleum industry. Although known to many as a professional administrator and mining educator in the University of Alaska system, it is difficult to understate Earl Beistline's professional achievements. In 1957, Beistline was elected a Fellow of the American Association for the Advancement of Science (AAAS), in recognition of his contribution to engineering sciences, and applied mineral research. In 1969, Earl was awarded an Honorary Doctorate of Law degree from the University of Alaska. In May of 1971, he was designated Engineer of the Year by the Alaska Society of Professional Engineers. In 1982, Beistline authored Placer Mining Methods for the McGraw Hill Encyclopedia of Science and Technology. He was chosen University of Alaska-Fairbanks Distinguished Alumnus for 1975 and awarded the Distinguished Alumnus of the School of Mineral Engineering in 1992. Earl Beistline retired from the University in 1982, after 36 years with the institution, but his good works would not end there. In 1986, Earl was the motivating force behind the establishment of the Alaska Minerals Commission. He served as chair until the mid 1990s. The eleven continuing members of the commission have since had a demonstrative positive influence on minerals policy and business climate in the 49th State. This organization will now have to take the lead and tackle some important policy and regulatory issues affecting the Alaska Mining Industry today. In 1997, Earl and long time friend, former University of Alaska President William R. Wood, were the driving force in the establishment of the Alaska Mining Hall of Fame Foundation (AMHF). Earl served as its first President until 2003. Beistline served on the National Mining Hall of Fame's (NMHF) Board of Governors from its inception until 2005. Earl was able to convince the NMHF of the important contributions that some Alaskans made to mining, which resulted in the induction to the HMHF of Stephen Birch, Clarence Berry, Alfred H. Brooks, Fred Bradley, John Treadwell, and Ernest Patty. It is said that Earl threatened the Board of Governors with "sending permafrost to Colorado" if his Alaskan nominations were not approved. On September 9th, 2006, Earl Beistline himself was inducted into the National Mining Hall of Fame at a ceremony in Leadville, Colorado. During the 1990s, Beistline partnered with colleague Ernie Wolff to serve as advisors to author Leslie Noyes, while she researched for her book Rock Poker and Paydirt: The History of Alaska's School of Mines and its Successors. This book, which was published in 2001, has become the accepted summary on the history of mineral education at the University of Alaska. In his retirement years, Beistline was very active as a professional consultant for GHD Resources (GHD), a successful placer mining firm active in several mining districts in Interior and Western Alaska. During much of the 1980s, Earl's association with GHD revolved around his expert knowledge of the placer deposits of the Circle mining district, notably the Eagle Creek placer. Many Alaskans know Earl for his very active roles in the Pioneers of Alaska Igloo #4, the Alaska Miners Association, Society of Mining and Metallurgical Engineers (SME), Boy Scouts of America, various Lions Clubs, Rotary, and the Fairbanks Chamber of Commerce. Until recently, he has spent much time at his retirement cabin near Central in the Circle mining district, where he greatly enjoys gardening and the simpler tasks in life. "I want to let you know how much I hold you in high esteem and how you have always been a model on how I wanted to live my life. You (Earl) have made superb contributions to Alaska mining, your University, and to the Fairbanks Community." "Earl was the 'go-to-guy' within the State Administration during the late 1960s and early 1970s......He took whatever position that was asked of him and did the job very well. If there was ever a 'Medal of Honor' to be awarded to anyone in the University system, it should go to Earl Beistline. I cherish his friendship and that of his wonderful, late wife Dorothy." "We worked together as athletic managers at the School, then in the mining club and other activities.....as Dean, Earl played an important role in getting me started in my South American adventures, and later in mining camps throughout the world." "He held his position in the (UA) administration and commanded tremendous respect and credibility with an efficient, hurry-up but happy, no-nonsense style that accomplished things effectively. Dean Beistline didn't like to waste time." Other students remember Beistline with similar respect, and nearly all cherish their association with Earl learning underground mining skills in the maze of tunnels beneath the University of Alaska-Fairbanks campus. Colleagues in the mineral community regarded Earl as a walking encyclopedia of Alaska mining, and would put to use his excellent, well organized files in his often visited office on University Avenue in Fairbanks. A true inspiration to students, co-workers, and the mining industry at large, Earl Hoover Beistline has tirelessly worked as an educator, avid historian, and active member of many civic and mining organizations for many years after his 'official' retirement. Dean Earl Beistline demonstrating to a mining class, date unknown. Morris, Chuck, 2006, Mining Hall to Induct Four: National Mining Hall of Fame Press Media Release, 2 pages. Stricker, Julie, 1998, Earl Beistline, in, Alaska Business Hall of Fame-1998: Alaska Business Weekly, p. 42-43. Wilcox, Brenda, editor, 1998, Personnel Recollections of Earl Beistline in Celebration of his 80th Birthday: University of Alaska Alumni Association, 44 pages.